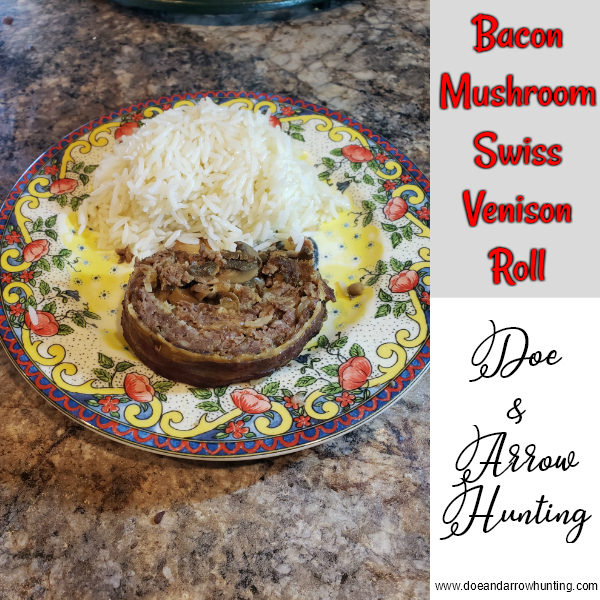 If you’ve never made a venison roll, you will be amazed just how easy it is! And, you will definitely wow your family and friends when you serve up one of these beauties. If you’re anything like me, and love creating new recipes, once you have the basic process of a meat roll down, the possibilities are endless! Place all ingredients in medium bowl (reserve the remaining 1/2 packet of soup mix for filling). Using hands, mix thoroughly. Next, dump onto parchment paper lined cookie sheet. 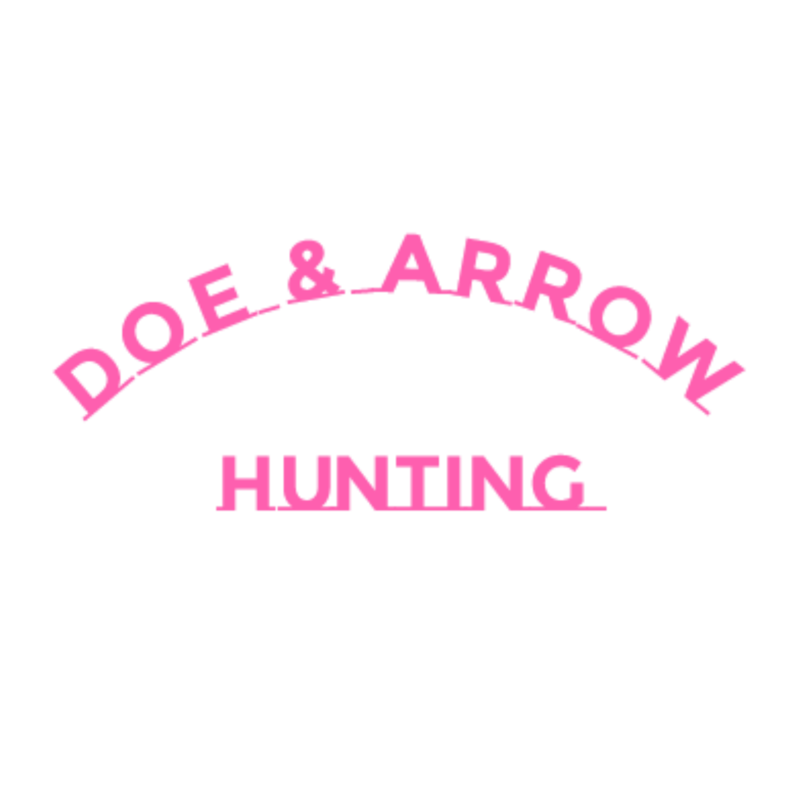 Use your hands to spread venison mixture evenly onto pan. (Pro Tip: Keep a bowl of warm water near pan. Dip hands in water before spreading in order to make the process easier. You may need to repeat this process until completely spread). Layer cheese on top of venison. Place drained mushrooms, water, and soup mix in small skillet and cook until liquid is almost completely cooked off. Pour and spread mushrooms over cheese, leaving room around edges in order to make it easier to roll. If desired, add more cheese on top. Now, it’s time for rolling. And, don’t worry; it’s much easier than you think. The secret is in using the parchment paper to guide you. Start by lifting the parchment paper on one end in order to slightly fold one end of the meat over. Shape the folded end into a roll; you may need to tuck any mushrooms along the edge up into the roll. Now continue to use the parchment paper to form the roll, by lifting with one hand and using the other hand to keep tucking the mushrooms inside, if necessary. The meat should maintain the shape of a roll as you lift the paper; however, you may need to occasionally aid the shape with your other hand. Once you reach the other end, fold venison over to complete the roll. Pinch the edge and smooth. You can use your water to help smooth the edges if needed. Cover completely with parchment paper and roll back and forth across cookie sheet, using gentle pressure. Now uncover and roll again. Place bacon over top of roll and tuck under on one side. 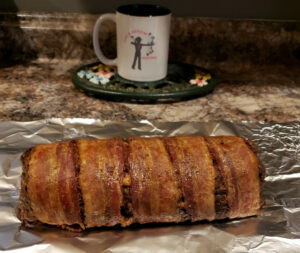 Again, use your parchment paper to aid in turning your roll in order to wrap bacon completely around venison roll. Once the roll is bacon wrapped, use your parchment paper to transfer it to a sheet of foil. Loosely wrap foil around venison roll and place on cookie sheet. (Pro Tip: Place an extra sheet of foil under wrapped roll in order to protect cookie sheet from possible leaking of bacon grease or cheese). Bake at 375 degrees for 45 minutes. Uncover and bake an additional 15 to 20 minutes at 425 degrees in order to brown bacon. Or, you can place roll under broiler for faster browning. Serve with your favorite side dish. Top with additional cheese, or maybe some mushroom gravy. Or, slice thin for a perfect sandwich. No matter how you have it, you’re going to love this one!